The images to the left of each testimonial show the original copy. Click to enlarge. I want to thank you again for your efforts and results regarding a recent client referral. As you know, most attorneys practice in certain areas of the law, and it is wise to retain an attorney that practices the area of law that matches a client’s needs. My practice covers a wide variety of civil and administrative law, including litigation, but I do not focus on personal injury law. 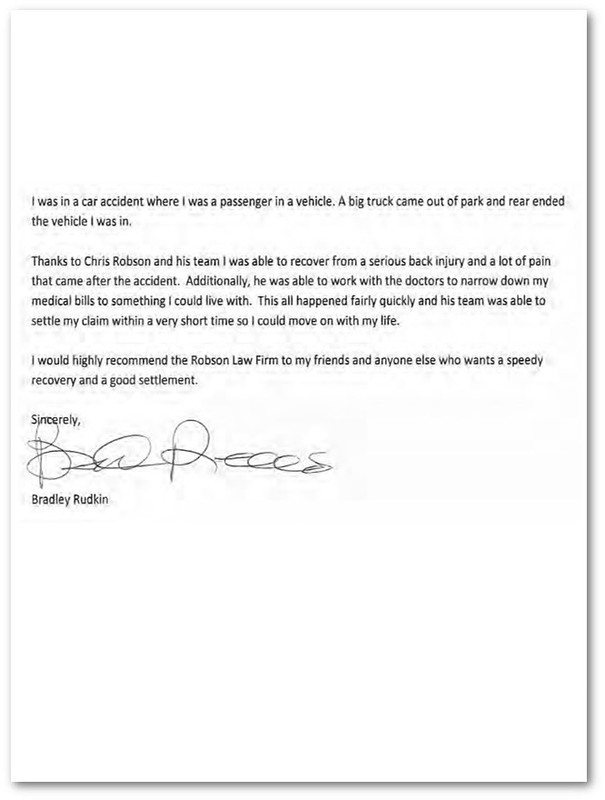 Accordingly, when my friends and client’s sustain bodily injuries, I have been confident in referring them to Chris Robson at Robson Law Firm because bodily injury is all that they do. 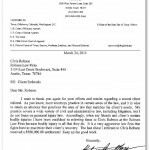 It is a very aggressive law firm that fights hard to maximize their client’s recovery. 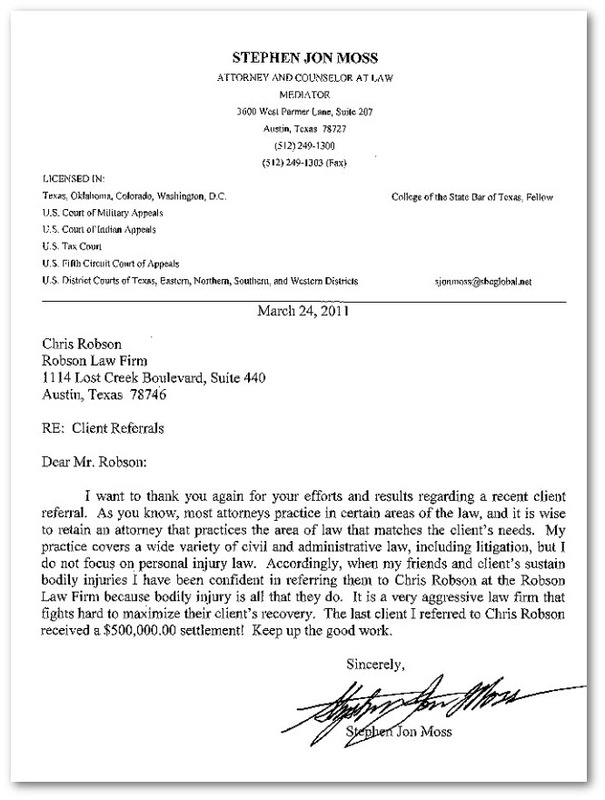 The last client I referred to Chris Robson received a $500,000.00 settlement! Keep up the good work. When I had a motorcycle accident, I was severely injured and could not explain to the police officer what happened, so the police officer listed me as at fault. This led the insurance company to deny my claim, leaving me with horrific injuries, unable to work, and with no way to get the medical care I needed. Fortunately, the Robson Law Firm believed me when I told them I was not at fault. They conducted their own investigation and even hired expensive engineering experts to prove that the accident truly wasn’t my fault. My attorneys also got me expensive medical care to help me recover from my injuries and get my life back in order. The Robson Law Firm got the insurance company to accept responsibility for the claim and offer me $1 million dollars at mediation. My attorneys thought I could do better and they were right. A few months later, they convinced the insurance company to pay me $1.2 million! My name is Joel Rodriguez. I was in a car accident and had neck and back injuries. My car was totaled and none of this was my fault. I was referred to Chris Robson at the Robson Law Firm. Once I spoke to Chris, he personally came to my home the next day and informed me of how he could help me get into a new car, have my injuries taken care of, and even compensate me for my pain and suffering. Chris and his team handled all the paperwork, got me my doctor appointments and negotiated with the insurance company. I never had to deal with anybody but Chris and his team. Despite the insurance company being difficult, Chris and his team handled every incident in a professional manner. Chris was so helpful through the whole process and kept in contact with me day in and day out. He took care of all my problems. For that, I thank him and his team. If I ever get injured again, I’m calling the Robson Law Firm. 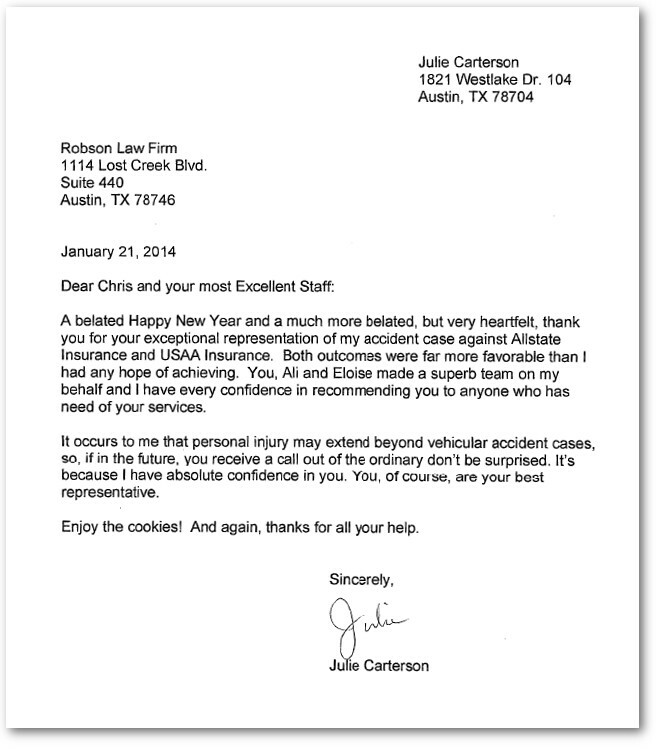 A belated Happy New Year and a much more belated, but very heartfelt, thank you for your exceptional representation of my accident case against Allstate Insurance and USAA Insurance. Both outcomes were far more favorable than I had any hope of achieving. You, Ali and Eloise made a superb team on my behalf and I have every confidence in recommending you to anyone who has need of your services. It occurs to me that personal injury may extend beyond vehicular accident cases, so, if in the future, you receive a call out of the ordinary don’t be surprised. It’s because I have absolute confidence in you. You, of course, are your best representative. Enjoy the cookies! And again, thanks for your help. 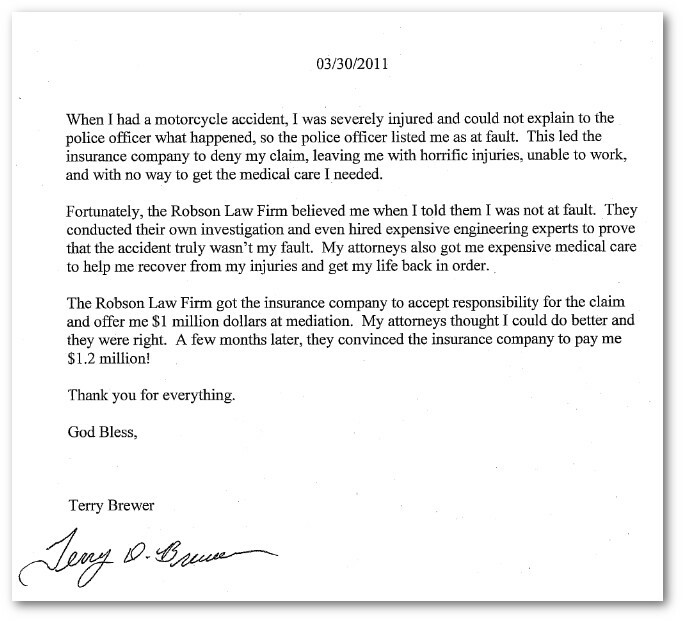 When I was injured in a construction site accident, I hired a law firm that promised me great results. However, when the at-fault party’s insurance company denied my claim, my lawyer dropped my case without putting up a fight. Fortunately, I learned of the Robson Law Firm and decided to give it another try with them. 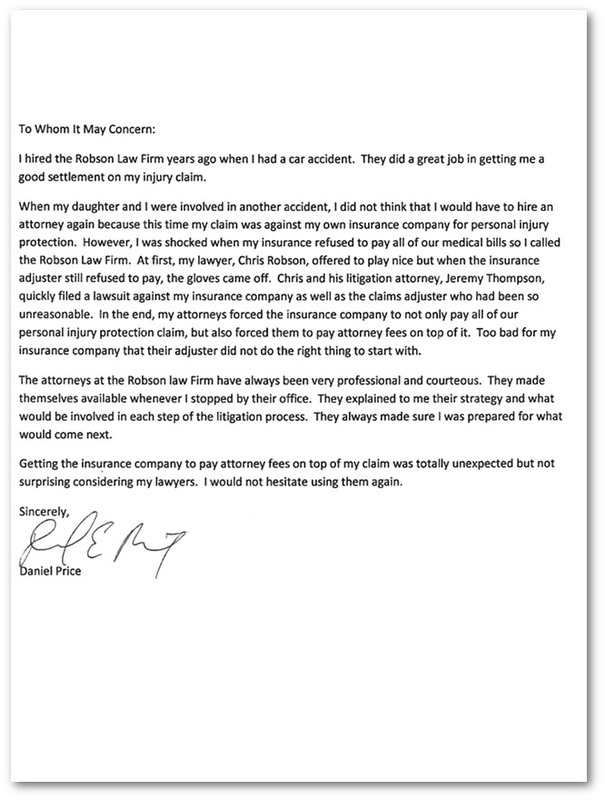 Although the insurance tried to deny my claim again, the Robson Law Firm fought for my rights and were able to get me a $137,500.00 settlement without ever having to go to court. Thank you for not giving up on my case like the other law firm did. I was in a car accident where I was a passenger in a vehicle. A big truck came out of park and rear ended the vehicle I was in. Thanks to Chris Robson and his team I was able to recover from a serious back injury and a lot of pain that came after the accident. Additionally, he was able to work with the doctors to narrow down my medical bills to something I could live with. This all happened fairly quickly and his team was able to settle my claim within a very short time so I could move on with my life. I would highly recommend the Robson Law Firm to my friends and anyone else who wants a speedy recovery and a good settlement. 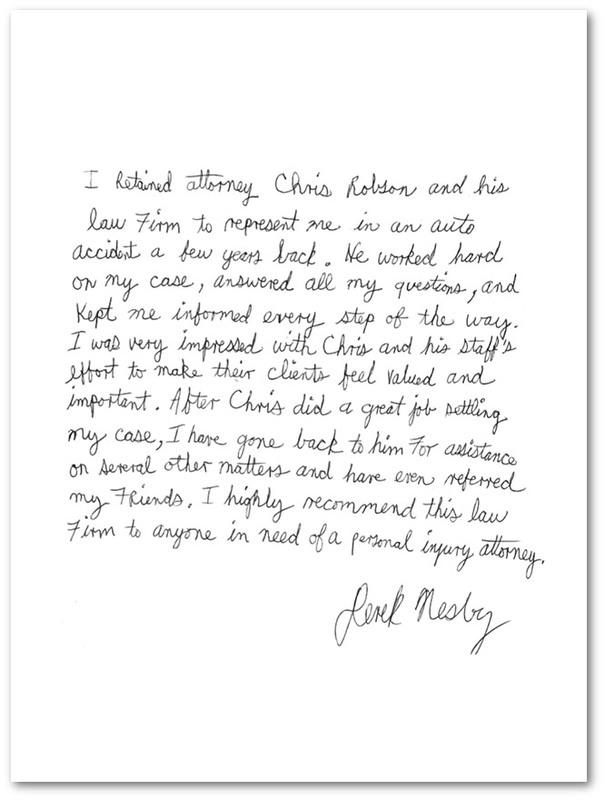 Chris, Jeremy and the quality that the law firm handled my case in the most professional and timely manner. I am very much appreciative for their time and hospitality on how they treated me since the day I walked in to the day my case was settled. 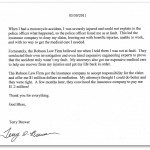 I hired the Robson Law Firm years ago when I had a car accident. They did a great job in getting me a good settlement on my injury claim. When my daughter and I were involved in another accident, I did not think that I would have to hire an attorney again because this time my claim was against my own insurance company for personal injury protection. However, I was shocked when my insurance refused to pay all of our medical bills so I called the Robson Law Firm. At first, my lawyer, Chris Robson, offered to play nice but when the insurance adjuster still refused to pay, the gloves came off. Chris and his litigation attorney, Jeremy Thompson, quickly filed a lawsuit against my insurance company as well as the claims adjuster who had been so unreasonable. In the end, my attorneys forced the insurance company to not only pay all of our personal injury protection claim, but also forced them to pay attorney fees on top of it. Too bad for my insurance company that their adjuster did not do the right thing to start with. 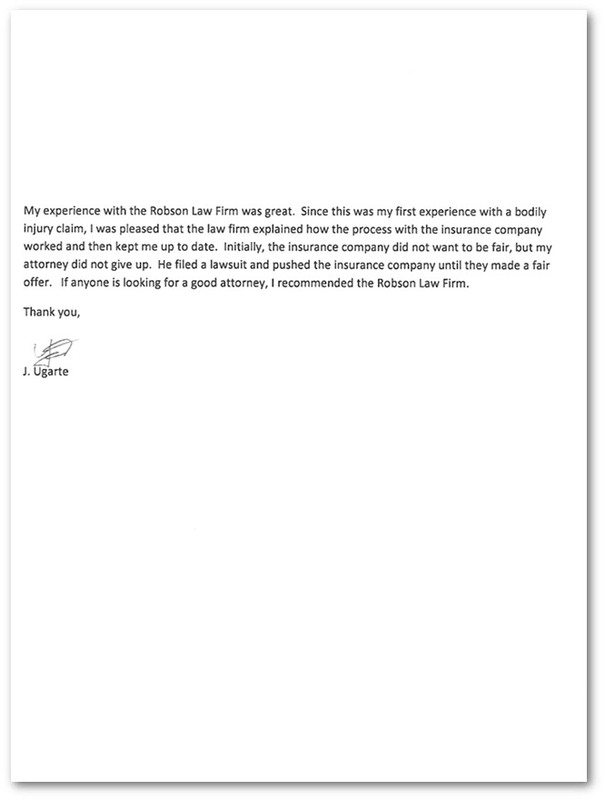 The attorneys at the Robson law Firm have always been very professional and courteous. They made themselves available whenever I stopped by their office. They explained to me their strategy and what would be involved in each step of the litigation process. They always made sure I was prepared for what would come next. Getting the insurance company to pay attorney fees on top of my claim was totally unexpected but not surprising considering my lawyers. I would not hesitate using them again. The Robson Law Firm including Jeremy was very helpful and thoughtful through my whole ordeal. They by far are the most honest caring lawyers I have ever met. On several occasions they even stayed really late to solve some of my issues. They worked very hard to get me every last dollar I deserved. I would highly recommend them to anybody with a legal issue. They not only treat you like a star client but like a real human being. 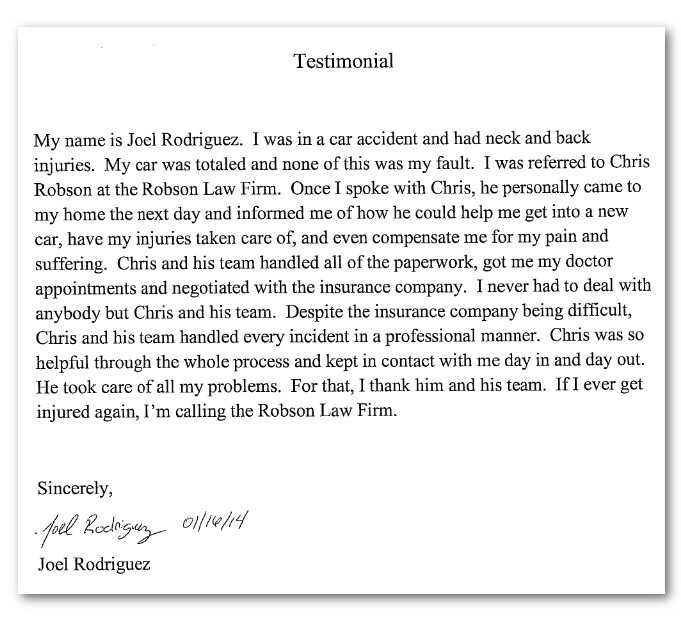 I retained attorney Chris Robson and his law firm to represent me in an auto accident a few years back. He worked hard on my case, answered all my questions, and kept me informed every step of the way. 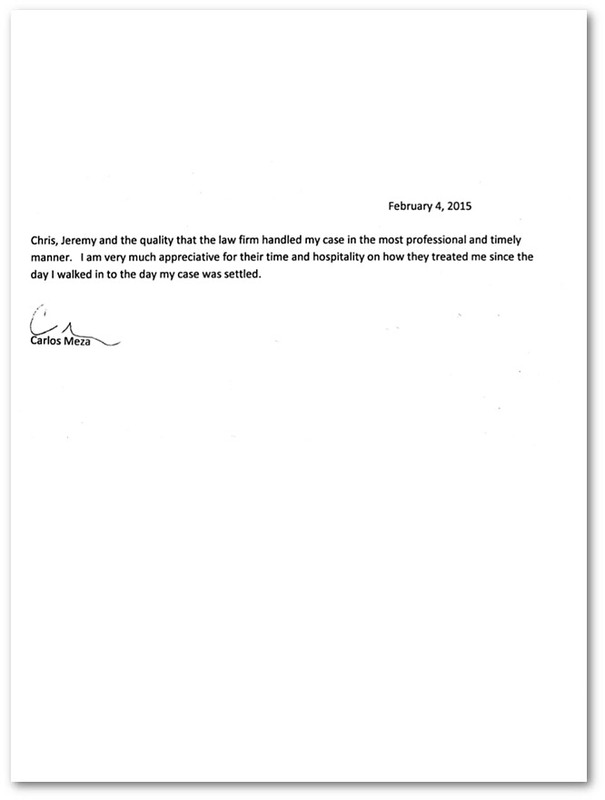 I was very impressed with Chris and his staff’s effort to make their clients feel valued and important. After Chris did a great job settling my case, I have gone back to him for assistance on several other matters and have even referred my friends. I highly recommend this law firm to anyone in need of a personal injury attorney. I was in an auto accident that totaled my vehicle. I suffered severe neck and back pain. Even though I did not have any health insurance or extra money for medical care, the Robson Law Firm quickly got me into therapy followed by epidural steroid injections with a pain specialist. Eventually, I was told I would need to undergo surgery for a cervical fusion. To my amazement, the Robson Law Firm was even able to get the surgery for me. 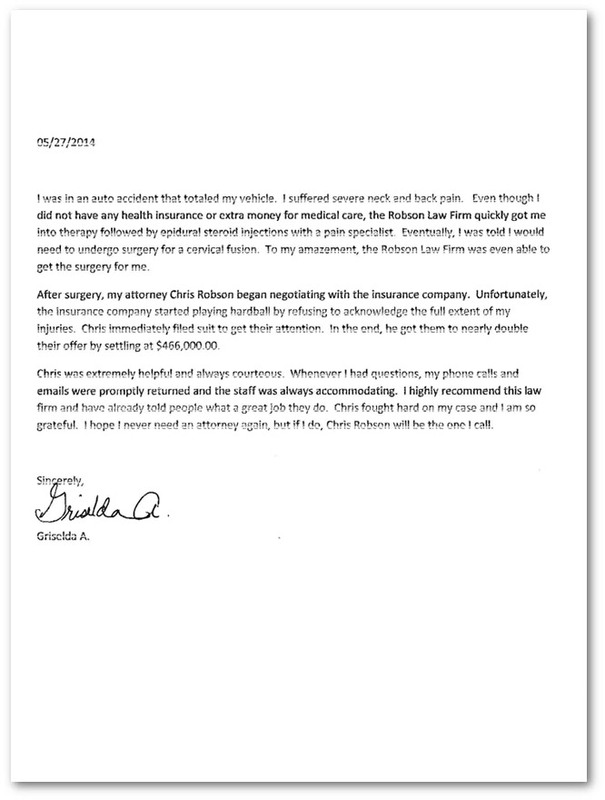 After surgery, my attorney Chris Robson began negotiating with the insurance company. Unfortunately, the insurance company started playing hardball by refusing to acknowledge the full extent of my injuries. Chris immediately filed suit to get their attention. In the end, he got them to nearly double their offer by settling at $466,000.00. Chris was extremely helpful and always courteous. Whenever I had questions, my phone calls and emails were promptly returned and the staff was always accommodating. I highly recommend this law firm and have already told people what a great job they do. Chris fought hard on my case and I am so grateful. I hope I never need an attorney again, but if I do, Chris Robson will be the one I call. 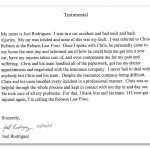 My experience with the Robson Law Firm was great. Since this was my first experience with a bodily injury claim, I was pleased that the law firm explained how the process with the insurance company worked and then kept me up to date. 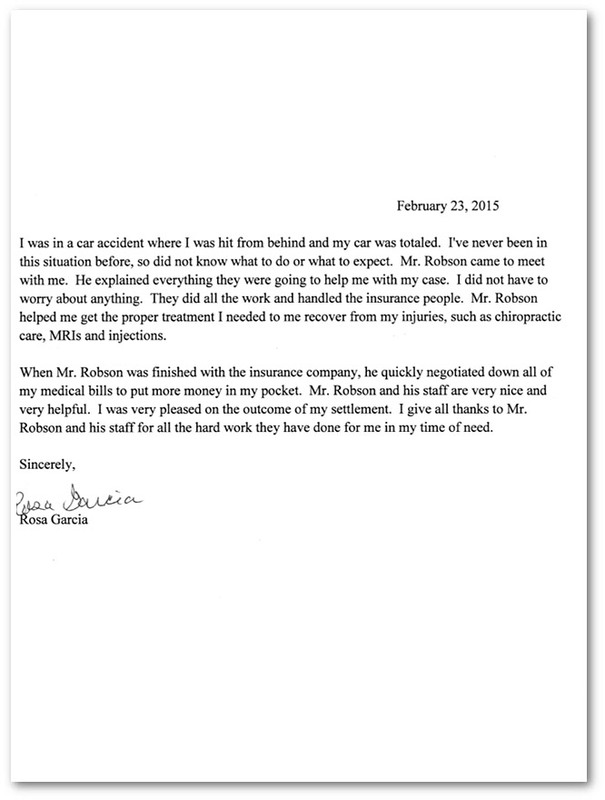 Initially, the insurance company did not want to be fair, but my attorney did not give up. He filed a lawsuit and pushed the insurance company until they made a fair offer. If anyone is looking for a good attorney, I recommended the Robson Law Firm. 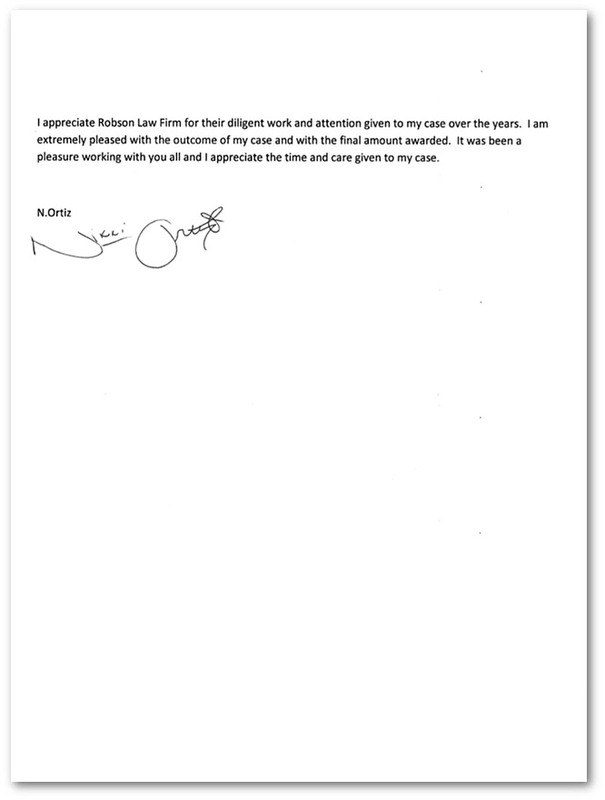 I appreciate Robson Law Firm for their diligent work and attention given to my case over the years. I am extremely pleased with the outcome of my case and with the final amount awarded. It was has been a pleasure working with you all and I appreciate the time and care given to my case. I was in a car accident where I was hit from behind and my car was totaled. I’ve never been in this situation before, so did not know what to do or what to expect. Mr. Robson came to meet with me. He explained everything they were going to help me with my case. I did not have to worry about anything. They did all the work and handled the insurance people. Mr. Robson helped me get the proper treatment I needed to me recover from my injuries, such as chiropractic care, MRIs and injections. When Mr. Robson was finished with the insurance company, he quickly negotiated down all of my medical bills to put more money in my pocket. Mr. Robson and his staff are very nice and very helpful. I was very pleased on the outcome of my settlement. I give all thanks to Mr. Robson and his staff for all the hard work they have done for me in my time of need. The Robson Law Firm was great. After I got in a car accident their biggest concern was to get my back pain taken care of. They did just that and referred me to the right people. I got the help I needed. They’re great! I was injured due to negligence at a big chain store (HEB Grocery). HEB employees and their attorneys did all they could not to take responsibility so I decided to lawyer up. To my disbelief, I tried several law firms but they all dropped my case because they said HEB would not pay. Then I stumbled upon the Robson Law Firm. They did not care that HEB was going to be a tough fight. The Robson Law Firm fought hard. In the end, they got HEB to settle my bodily injury case. To my surprise, the Robson Law Firm even took on Medicaid in order to significantly reduce its lien so I could put more money in my pocket. HEB did not take me seriously, but my lawyers Chris Robson and Jeremy Thompson did. I was first referred to as a diamond in the rough. In the end, I came out polished and shinning with closure – much needed closure having HEB being forced to accept responsibility for their negligence. Call (512) 345-8200 to speak with an Austin personal injury lawyer who can help you.